Co-owner Gia Trapani has always loved animals, so it is only natural that she devotes her life to working with them. In fact, she has worked with pets since childhood, first helping her parents run their licensed in Kansas no kill animal shelter, to then cleaning the shop of her family’s dog groomer (where incidentally she met a young Barb Hoover who was herself just learning to groom! ), to managing a local pet sitting company and training to groom, to the finally fully realized dream of co-owning a pet care company and co-owning a dog and cat grooming salon. She holds an associates degree in arts and a Bachelors of Arts degree in Journalism and creative writing (she did not declare a minor but lacked only a couple credit hours from one in Sociology). As a pet care professional, she is driven and passionate and takes her career very very seriously. She is pet CPR certified (and has been twice) and is all about continuing education classes and learning continuously about the beings she works with everyday. Particular areas of interest she reads/studies up on and attends conferences on are animal communicating, the safe proper use of essential oils around animals, canine massage, canine nutrition, and proper skin and coat care. When she isn’t working, Gia enjoys odd films (David Lynch, John Waters, and Almodovar are some of her favorite directors and she loves really bad lesbian and really bad horror films), binge watching The Walking Dead and American Horror Story (especially season 3), and re watching X Files episodes. She is a writer (of poetry mainly and some short stories) and is also a voracious reader of both fiction and non fiction and her personal library of books is one of her most cherished things. Most of all though, she enjoys spending time with her wife, co-owner Jennifer Orton, a small trusted circle of friends whom they regularly brunch with on Sundays (they love to find new local places to get their eat on at) and playing with and snuggling with and just being with the biggest delights of her life, her pack of dogs. Co-owner, Jennifer Orton, grew up in Arkansas before moving to Kansas City. An avid equestrienne, she considered studying veterinary medicine before realizing that foreign language was her niche. She holds a B.A. in Spanish Language and Literature, and an M.A. in French Language Literature. 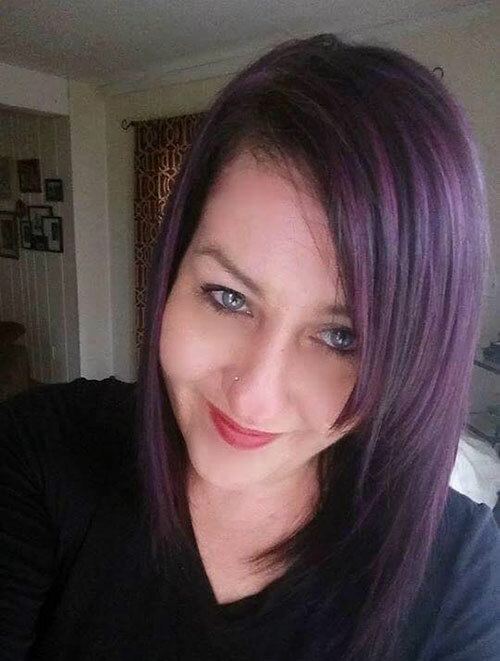 Jennifer regularly attends continuing education and specialty classes for groomers and is a member of ISCC (International Society of Canine Cosmetologists) through which she will be pursuing certification. 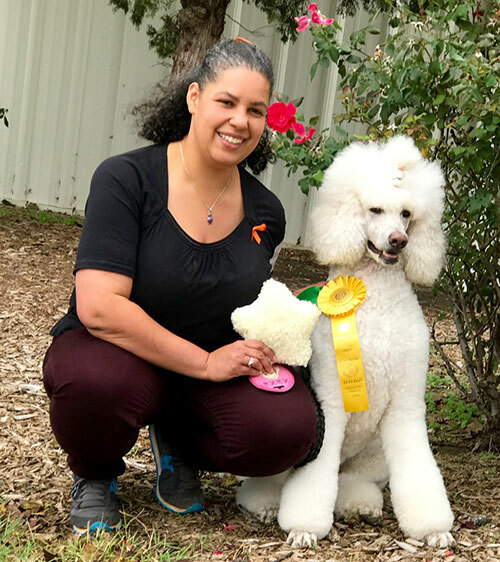 She is AKC certified in Safety and Poodles, certified in Creative grooming, and enjoys hand stripping wire-coated breeds. 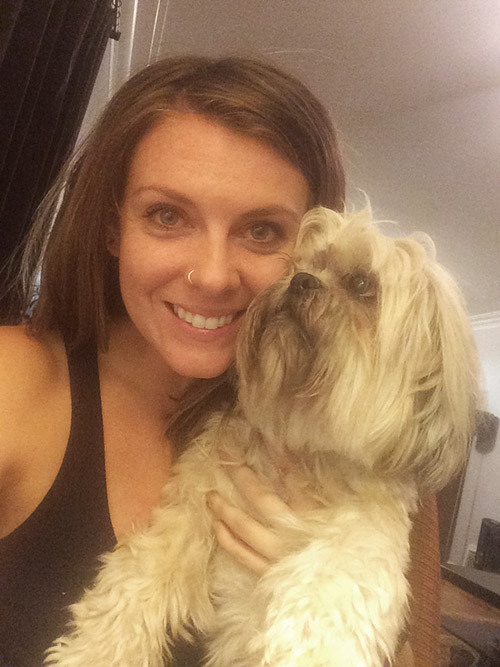 A lifelong dog owner, Jennifer considers her dogs her children, and prefers to spend her spare time with them. She and Albus enjoy traveling to conformation dog shows, and training and competing in AKC Rally. She and Cécile enjoy swimming together in Lake Michigan on summer vacations, and catching movies at the drive-in. Jennifer enjoys attending arts events in Kansas City, traveling, reading, painting, and gardening. New to our staff as of May 2013 is part time groomer Barb Hoover. Barb has been grooming professionally since 1985 and is certified through the National Dog Groomers Association of America in the Non Sporting and Terrier groups. She is very active in the industry and finds it is important to stay up to date with grooming trends, equipment and safety. 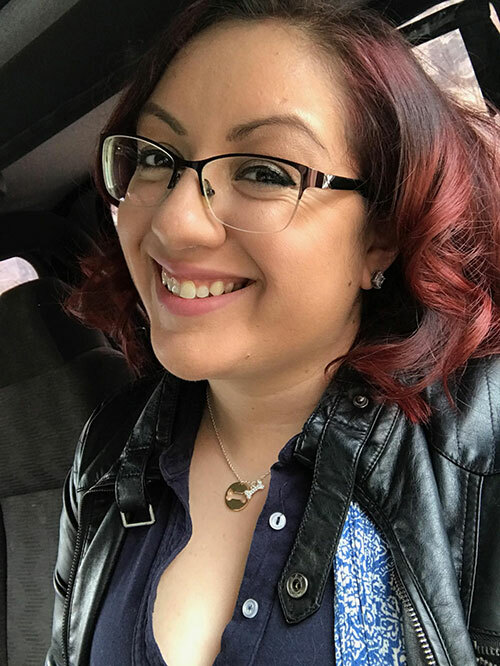 She owns a large industry website for pet groomers, attends as well as teaches continuing education classes all over the country throughout the year, has done speaking, and has written for professional trade magazines. Barb won the prestigious David G. Salzberg Cardinal Crystal Grooming Achievement Award for Outstanding Contribution to the Grooming Industry in 2007 and has been nominated for 4 Barkleigh Honor Awards. Her love of dogs extends to helping the community through her involvement with the Leavenworth Animal Welfare Society, as the former Co Director and Secretary, as well as many years of fostering,volunteering and rehab work. She shares her home with 3 Standard Poodles, a Toy Poodle, an African Grey Parrot and a Lesser Sulphur Crested Parrot. Fun side note: At around 15 years old Gia helped clean the shop where a very young Barb worked and the two reconnected through Facebook many years later. Megan joined our crew as a part time groomer in March of 2016. She is a Kansas City, Missouri native. 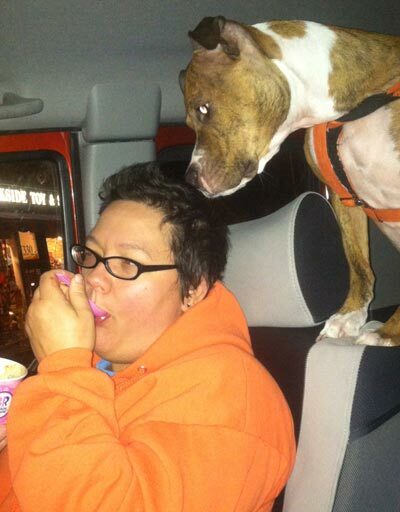 She has been grooming dogs for 15 plus years and also spent 4 years as a veterinary technician. It is not unusual she has made working with pets a career since for her whole life animals and her love for them have always played a huge part. In her younger days, riding and showing horses were her hobbies and her current passion is raising chickens. She is a mom to two wonderful human children, Wolfgang and Kasen, 3 dogs, 1 cat, and 11 chickens. To simply sum up Megan solely for her interest in grooming and pets tho would be a disservice as her deep love of music, baking, mid century design and the funereal industry makes her someone who can converse on just about anything. She and Gia share similar quirky tastes in fact in music, movies and books and can often be found chatting about everything from Twin Peaks to The Sundays to John Waters. Fun fact is that it is astonishing these two never met before a few years ago as they moved in the same circles and in the same part of KCMO in their very early twenties lol. Audriana has always been in charge of washing the family pets. At 12 years old, she walked into her first big box pet store and was immediately drawn to the grooming salon. Watching through the window, she wondered “what was happening?” Three years later she got her first job as a pet bather. Two years after that she graduated high school and then began grooming school. On her last day of grooming school, Audi walked in and locked eyes with a handsome blonde Cockapoo who happened to be looking for a home. Jorge went home with her that day. Audi is now 27 years old and has never regretted her decision to dedicate herself to her grooming career. She is AKC safety certified and Barkleigh CPR certified. She certainly has come a long way from the hose and bottle of shampoo in the family back yard. In her free time, you can find Audi working out, cooking or reading a book. She also loves to find new wonderful places to brunch. She shares her home with an FIV positive old man kitty named Mellow and a now nearly deaf old man cockapoo, Jorge. Silly shop joke: Jorge spends his days as a shop dog sleeping on a giant cushy bed and sleeping so deeply that we figure he sneaks out and parties all night lol. We say Jorge loves to rave and is known on the rave scene as Jorgelina. DaLene DePriest, our new front counter help/customer specialist, and the lady who keeps us sane by performing a thousand and one small functions (changing laundry over, making caffeine runs, helping stabilize an elderly unsteady dog and so much more) is also known as Lady Day to her family and friends. 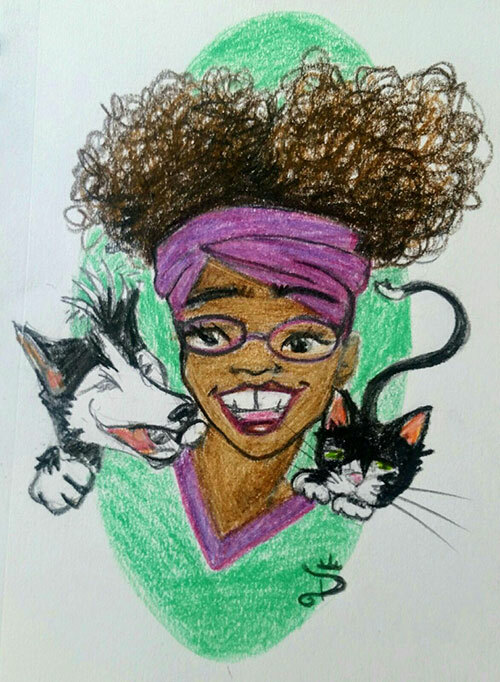 She is an artist/carpenter, as well as a puppeteer who holds a BFA in Illustration (The puppeteering and illustrator are her fun jobs as she refused from a young age to ever be called a “starving artist”). She is often heard quoting a mysterious Ms. Toni but she can most often be found telling the latest antics of “those little pyrates”, Bhodi.S Jones Esq. (cat son) and his baby brother Scrappy DooWayne Jones D Derksen (dog son). 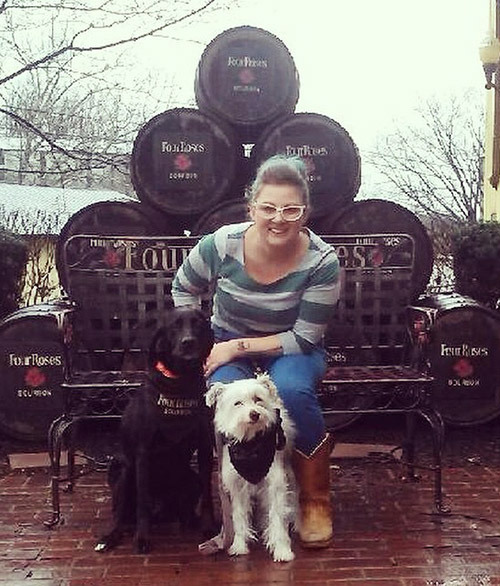 Sophie, our newest front desk person, has an extensive background in working with dogs. She grew up on a farm in the Upper Peninsula of Michigan. There she started working as a vet assistant. Sophie later moved to Kansas City where she continued to work with vets. She also has helped open up a couple of doggy day cares. It’s safe to say that Sophie has always loved dogs. Until recently she competed across the country with her black lab Ella (recently passed) in the sport of Dock Dogs. These days, her and her hairy hairless, Bing Bong Crosby are enjoying hiking trails and long walks together as they grieve for and heal from the loss of their mutual bestie, Ella. When Sophie isn’t greeting you and giving a helping hand with retail she enjoys performing burlesque locally and loves seeing live music. Mel began as a client a few years ago when she first rescued her dog, Peggy Sue (or Margaret Susan as we call her lol). When not at SGBG working the front counter checking dogs in and out and keeping life easier for the groomers by keeping towels clean, running for coffee so we remain well caffeinated and making treat sacks for our doggie spa guests, Mel is a hair stylist. She enjoys being an introvert, indulging in the occasional Netflix binge and going on adventures with Peggy Sue.